Author’s note: In this piece (and the others in this column), I introduce and explain new or often misinterpreted terminology used by many of the world’s top distance coaches to describe specific workouts. Understanding these terms as they pertain to your training will help you better comprehend the purpose of each of the workouts in this and subsequent columns. Ultrarunners are tough. We must be in order to fulfill the demands we ask of our bodies and minds during long distance events. Undoubtedly, there comes a time in most races when an ultrarunner’s mental and physical mettle is put to the test. Though short in duration, performing challenging speed-based workouts is a way to simulate pushing through difficult race-day scenarios by learning to overcome the body’s desire to slow or, worse, stop. The need for speed work has been hotly debated in the ultrarunning community. Geoff Roes and I present our respective cases in Bryon Powell’s book, Relentless Forward Progress. Because we enter events and embark on adventure runs for very different reasons, speed work may not be necessary for every ultrarunner. However, this kind of high intensity training provides benefits that may help resolve performance plateaus and boredom brought on by the exhaustive nature of long distance training and racing. These enhancements, working in concert, allow us to reach our maximum aerobic capacity or VO2 max. VO2 max refers to the maximum amount of oxygen an individual can use during intense exercise. This measurement is an indicator of an athlete’s endurance and cardiovascular fitness. The more oxygen you can utilize during hard bouts of exercise, the higher your VO2 max, and the more power you can produce during a workout. VO2 max has a genetically predetermined ceiling. Less fit individuals can expect to see big gains through VO2 max training. However, as fitness improves, it becomes more difficult to see improvement as you close in on this predestined maximum. Age – VO2 max generally peaks in the mid-20s and declines as you get older. Biomechanics and technique – Inefficient runners (due to poor technique or significant leg length discrepancies) expend more energy than those who are efficient. Environment – Running surface, temperature, altitude, wind, and hills will alter oxygen consumption rates. Fatigue – Muscle damage from hard training and racing will inhibit proper mechanics and efficiency. A commonly asked question is this: Does a higher VO2 max always lead to success? The answer: No. There are still several other factors that weigh heavily in performance outcome. Lactate threshold training – As discussed in last month’s Stamina-Based Workouts piece, LT training can also allow an athlete to run farther faster. Psychological fitness – Even if fitness levels are equal, the victory will always go to the runner with the greater will. Physical health – Proper recovery methods and nutritional habits will aid in performance enhancement. Speed-based workouts, sometimes referred to as VO2 max intervals, last between one and six minutes with paces that emulate an 8- to 15-minute race. Fast, intense reps! Heart rate for this kind of training will range between 94% and 98% of maximum. Because we can only spend a short amount of time at these speeds, a recovery jog is required between repeats. These jog intervals should last roughly one-half the distance or the same duration as the fast running. The goal of the workout is to spend a total of 10 to 30 minutes at these quick speeds. Several 4- to 5-minute fast repeats with 4- to 5-minute recovery jogs in between. Any combination of fast repeats and jog recoveries will suffice as long as the intensity falls within the parameters above. These workouts can be done on any flat to rolling surface with good footing. Keep in mind that the purpose is to run fast, so technical trails should be avoided. This type of training stresses the musculoskeletal system. Injury can result if a runner does too much too soon. If you are new to this type of workout, start on soft surfaces such as a track, treadmill, or well-groomed dirt path. Until you feel comfortable, run just a few of the shorter length intervals (roughly one minute) at a conservative pace. Integrating a modest amount of speed-based workouts into your training plan is all you need to reinforce efficient running technique, gain physiological benefits, and reinvigorate your training. McMillan, Greg. “Running Physiology and the Four Training Zones.” McMillan Running Adult Camp. SpringHill Suites, Flagstaff, AZ. 11 May 2012. Lecture. McMillan, Greg. 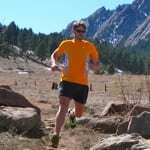 McMillan Running Company’s Online Coaching General Training Information Packet. Flagstaff, AZ: McMillan Running Company. Print. Noakes, Timothy. Lore of Running. 4th ed. Champaign, IL: Human Kinetics, 2003. Print. Powell, Bryon. Relentless Forward Progress: A Guide to Running Ultramarathons. Halcottsville, NY: Breakaway, 2011. Print. Great, keep it coming Ian. You mention boredom, but I think it should be emphasized. Speed workouts are a great way to introduce some variety to your log book. Since most of us don't do them very often, they are also fun. Think about it from your kids' perspective — mine, at least — they basically run around all day doing short sprints. They call it "playing," but somewhere along the line, adults start thinking of it as something to be avoided. To be fair, my kids probably stop a sprint when they get tired, where these workouts keep it going long after that. So, for adults it's uncomfortable fun, but still fun. On a more technical note, I suggest that people who are new to speed work or haven't done any in a long time, ease into it by doing what I call "strides" or "pickups," which are very short (100m or less) and accelerate to somewhere around 75% to 95% of your top speed, depending on how familiar your body is with that type of movement. 6-10 repetitions a couple-few times a week after a run (or even in the middle of a run). It starts introducing your muscles and connective tissue to the strains of interval work, giving them some time to adapt before you really start straining them with true speed workouts. Your closing paragraph gets at this, but introducing your body to strides for a couple of weeks before more structured speed workouts is a good way to avoid injury. Great advice…also I wonder how does this type of training differ to say a Tabata workout? I am not familiar with the Tabata system. Perhaps someone who is versed in it could chime in? I did a quick google search and looked at a few different sites. Tabata is very intense (all out) and the repeats (20 seconds) are much shorter than what's discussed above. The recovery intervals are also very short (10 seconds). The entire workout last for 4 minutes. You do this workout 3 or 4 times a week. Studies have shown that this work did increase VO2 max for individuals who weren't fit at the beginning of the study. However, that is the only data point studied. When looking at the entire runner it's important to look at all the other factors one must incorporate into a training regime in order to sustain hard efforts for long periods of time. It's important to remember that a runner, while working on their others disciplines like endurance and stamina, be wary of the amount of stress they are incurring during tough VO2 max sessions. My guess is that the Tabata system may be tipping the scales (both in intensity and number of times you perform these workouts in a week) toward the injury and over use side of things when you're running the kind of mileage an ultrarunner might be putting in. I'll throw in one other, much more minor, advantage of speed work that I've found. When you're always only doing the ultra shuffle at whatever your pace, your leg swing is not as great, and you can often get away with not engaging the glutes as much (my case, which likely contributed to an injury). And… you're not training the fast, long extension strides with large kick/swing behind you. Where this ends up helping is on the downhills in races, especially the mild downhills, like 2-5% in my case. Having done speed work makes me a lot more comfortable and confident in keeping up not only a high cadence (92-96 on these fast downhills), but having that cadence with really long strides, the combination of which reduces cumulative braking forces down the hills, and increases my downhill speed by lord, at least a min/mile. I meant 2-5% grade downhills, not helping me out 2-5%. But the speed increase when you let it rip, comfortably, is phenomenal. I would definitely agree. just a little bit of faster running (and not even that fast, maybe road marathon effort) combined with off-season strength training to strengthen my glutes and hamstrings has really improved my leg extension and push-off. I notice it on the "cruiser grade" downhills as you point out but also in the form of added power on slight uphills. great information! will you cover race strategy to improve our PRs? For example I always see that at the start of races the top runners always sprint to the front. I can't imagine them keeping that pace for the duration of a 30 or a 50 miler. Even at WS100, I noticed that they just kept going. I ran a little bit until I felt the hill getting steeper then I hiked with everyone else, but we lost sight of the top runners. what's the logic behind that initial sprint? Anyway if you ever cover race strategy maybe you can touch on that subject. I like to training tips though. Your wish is my command :) In a few more months, I'll begin tackling great questions like this from readers like you. I've added this topic to the list. I agree. Not to mention the added confidence boost you get by obtaining these faster downhill splits/times.